Before the advent of writing, the craft of recording visual remembrances “worth a thousand words” would leave an illustrative trail back through time for the benefit and edification of future generations. And over the millennia the wondrous crafts of etching, painting, sculpture—and eventually photography—would provide us all with the means of tracing our historic roots back to their origins. Now, here in this dazzling 21st Century, there are still those who find our past precious and deserving of being forever preserved. One of those intent on nurturing our venerable roots is Norwich resident Ken Keeley, an artist in his own right who has long held a deep affinity for New London County’s heritage. A 1967 graduate of Norwich Free Academy, Keeley then attended Thames Valley State Technical College and later wound up working at the Norwich Bulletin, mentored by news photographer Bill Stanley. Keeley worked his way up to production manager where he mastered the craft of composition, cut-and-paste, and photo type-setting—all of which would come to serve him later in life more than he might have imagined back then. “I worked for the Bulletin for 12 years and then partnered up with Nick Pelligrino in starting a small business, Franklin Impressions,” he said. “We had replaced a former printing company there that had gone bankrupt and we had to turn it around.” Keeley and Pelligrino succeeded in their venture, which entailed graphic design and commercial printing mostly for corporations. In 2002 they sold their business to Thames Printing. Ken Keeley found an enjoyable new niche in substitute teaching. “After working all those years directing my own company, I can honestly say I experienced a similar satisfaction in working for the schools in Norwich.” But little did he realize the next creative phase of his life was about to be generated … all due to his penchant for posting nostalgic old pictures on social media. He discovered a surprising number of people were eager to step into the photographic time portal he had created via images of Norwich’s most vivid and telling moments in time … some of them endearing, some comic, others even tragic; all harboring forgotten historical monuments that stirred old memories and also captured the attention of those unaware of the Rose City’s rich past. Founded in 1659, Norwich is a town whose landscape has been altered by the mighty elements: fire, flood, and the fury of the Hurricane of 1938. And when the city elected to celebrate its longevity and legacy and a festival emerged out of a mounting civic pride back in the early 1960s, Norwich businessman William O’Neill stamped the title of that momentous event, the “Rose Arts Festival.” Its stated mission was for Norwich to “reclaim its onetime status as the “Rose of New England,” as Keeley details in one of his books. Four paperback volumes: “Four Score & 10”, “Memories of a Norwich Boomer”, “Norwich: It’s Where Our Story Begins”, and “The History of the Rose Arts Festival” serve as a commemorative salute to unforgettable local events, architecture, heroes and celebrities, many talented artists, and, above all, regional pride. The books hold a hypnotic appeal that coaxes readers into exploring an “Alice in Wonderland” journey of vivid imagery. 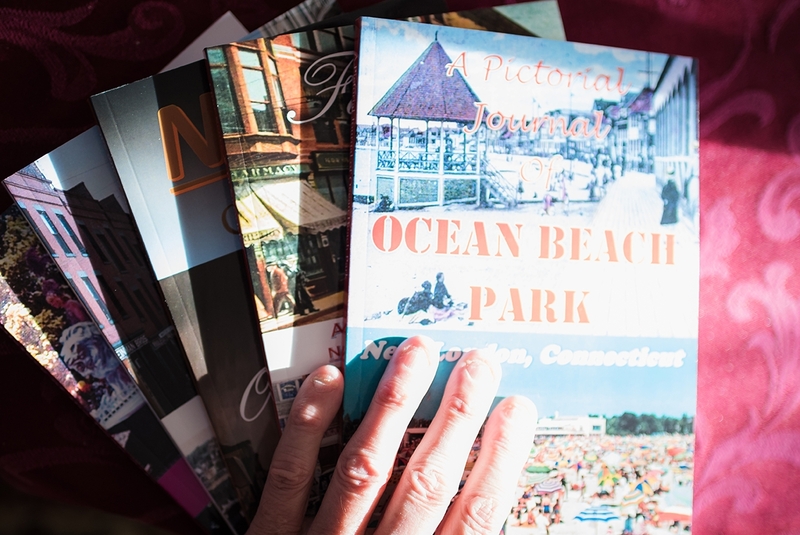 Now Ken Keeley seeks to do the same with a brand new paperback, recently released: “A Pictorial Journal of Ocean Beach Park”—its inaugural presentation to the public at the very site of what many people consider New London’s “Crown Jewel”—the beloved beach itself. The 9th Annual Ocean Beach Mile Long Tag & Craft Sale, held on the vintage boardwalk, hosted the mid-May release. As with his previous books, Keeley utilized his extensive background in printing to physically assemble the original proof copies before sending them out for print-on-demand orders. His wife of 48 years, Merrill Park Keeley, a gifted artist, designs all of the book covers and does the painting for them as well. “Even though this particular book’s focus is on a New London landmark (as opposed to Norwich), just about everyone in this region of the state has been to Ocean Beach at some time,” said Keeley. His eyes light up when speaking of the 1960s and early 1970s era and visiting Ocean Beach’s fabled boardwalk, its massive public swimming pool, its oldtime bath-houses, amusement park rides, and adventurous mini-golf. He recalls fondly the great 4-sided clock tower rising skyward and fairly lording over the entire beach territory. “Meet me at the clock,” Keeley smiled in recollection of a phrase coined by no one in particular, but used by nearly everyone in referencing a common point of navigation for all beachgoers. Keeley details the saga of that once prominent clock tower. He was saddened by its demise in the late 1980s, but now feels brightened by a public movement to restore it. The book chronicles Ocean beach’s long, happy history: beach umbrellas dotting the vast stretch of sparkling white sand like mini-neighborhoods; people picnicking, swimming and chatting in community. He hopes his work helps to unite the beach’s modern popularity with its iconic past – its late 19th century origins and landmarks like the old clock tower and the Gam building. He sees the work as a spiritual salute to an era he felt was idyllic in itself. Keeley’s books are all available at the Backus Hospital Gift Shop, occasionally at community events like the Rose Arts Festival (coming up June 30 in historic downtown Norwich), and especially by simply contacting him at home: 860-886-9936 or kenekjr000@comcast.net. They sell for $20 - $25. As with those dawn-of-time artists who chipped away on stone walls and etched pictures of the past that told ensuing generations such engaging tales, Ken Keeley has mustered together all of the photographic & printing skills he crafted over the years … and produced for us, and for generations to come, a passageway to a past we must never forget.